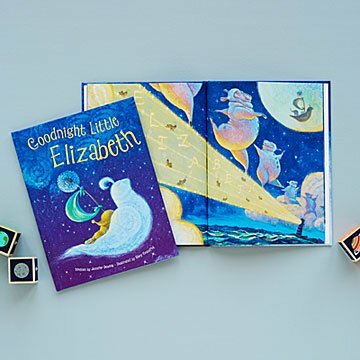 Treat your little one to a personalized goodnight, courtesy of this beautifully illustrated custom book. Treat your little one to a personalized goodnight, courtesy of this beautifully illustrated custom book by Jennifer Dewing. Featuring your child's name on the cover, throughout the story, and even in illustrations, this book comes packed with dogs, sheep, owls, and even crickets wishing them sweet dreams in lovely, lyrical prose. Made in Minnesota. As a gift for toddlers & young readers. So uplifting! Purchased to read to my first grandchild. Illustrations are beautiful. Such a clever and affirming way to connect with a little one! What a perfect New Baby gift! This was a gift for a long awaited healthy birth of the daughter of a friend of mine. This will be a treasured keepsake for little Carina. The mom and dad love the personal touch of the story. I was impressed by the overall quality of this book. Adorable, great for learning to spell his name! Very beautiful Illustrations < 3 It's helping my son learn to spell his name too! Ordered two and they are beautiful. Going to order another.